MacPaw is over the moon today — we’ve just launched Gemini 2, The Duplicate File Finder. It’s like the original Gemini that got new powers and almost human intelligence: Gemini 2 detects similar files, easily tells copies from originals, and adapts to the way you work with it. It’s free to download, so you can give it a try right away. What’s New in Gemini 2? Technically, retakes and lookalike pics are not duplicates, but they still take up your disk space. You can now find and remove similar files, too. Duplicate images are major space wasters, and they all live in your Photos library. We’ve added Photos support to Gemini 2, so you could find duplicate pics in their natural habitat. Even if two files look the same to you, they still differ by size, or location, or date. With Gemini 2, you see what the difference is at a glance, thanks to the handy icons. Let’s say you always delete the larger copy of a file. Gemini 2 will notice that, offer you to remember the choice, and start autoselecting larger files for removal. If you deleted the wrong copy by mistake, don’t worry: you can easily restore it. Gemini 2 moves files to the Trash and lets you put them back, if needed. You don’t even have to review the files, unless you want to. Just drop a folder, let Gemini 2 detect duplicates, and hit Clean. As easy as that. To run Gemini 2, you’re going to need an Intel-based Mac with 65 MB of free space on the disk and OS X 10.10 or later. All Gemini users get a lifetime 50% upgrade discount. Don’t put it off until later, though: this week, we add a gift license on top of your upgrade. And, if you justgot the original Gemini app (by “just” we mean between April 10th and May 10th), the upgrade is free for you. 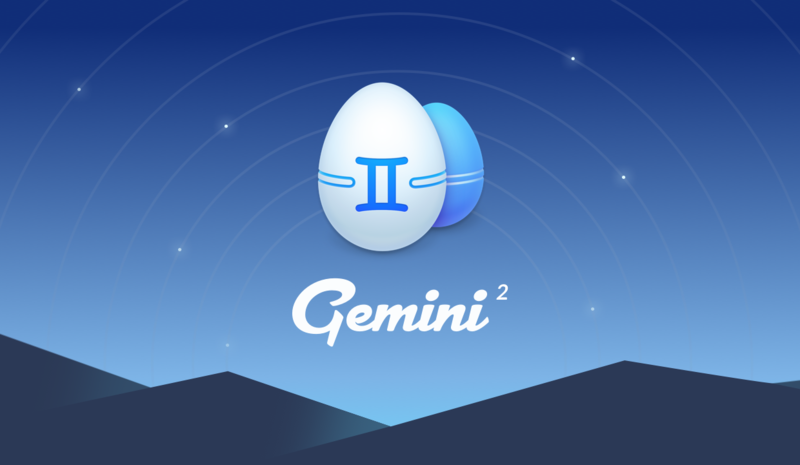 There’s also good news for folks who haven’t used Gemini yet: you can get Gemini 2 at half the price on our release sale. May 10th through May 18th, it’s 50% off for everyone. Anyway, we could talk about Gemini 2 for hours (literally), but why don’t you download it and take a look instead? Be sure to tell us what you think about it: we’re always in touch on Facebook and Twitter. P.S. Oh, and of course there’s an Easter Egg in Gemini 2 (there was an egg-shaped-logo joke here, but it was too cheesy). Tweet @macpaw if you can find it.